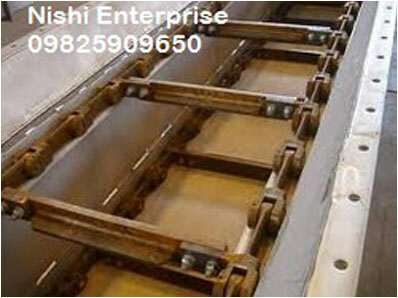 Nishi Enterprise is a leading manufacturer of top grade Heavy Duty Drag Chains that are known for their advanced performance. Our Heavy Duty Steel Drag chain products are designed and manufactured for the most severely abrasive as well as very high temperature applications. This means that you can use our Heavy Duty Drag Chains with hot clinker conveyor and hot lime drag conveyor systems that can have a temperature up to about 1000 degrees. In order to make sure that our products have the best fatigue life, we have made our Heavy Duty Drag Chains with only special heat treated as well as induction hardened pins. This naturally guarantees a very high level of heat resistance. We have also made sure that our Heavy Duty Drag Chains delivers much greater sliding resistance than the products that are manufactured by some of the other brands. Both sides of these chains come with a bead of solid hard face weld. Here at Nishi Enterprise, we make use of only the finest quality raw materials to create state of the art heavy duty drag chains that can pack a powerful performance for all your industrial needs. We are known for offering some of the best stainless steel heavy duty drag chains that can be used for metal treatments, steel industries and foundries. Our products are crafted from some of the most high quality raw materials that are then processed and worked on by our highly experienced specialists. Our heavy duty drag chains are available at the most cost effective prices which mean that you can greatly benefit from buying our products in more ways than one. Our products offer high resistance to wearing, tearing and abrasion. They also have self lubrication property as well as guarantee a long functional life. These products are used for numerous heavy duty applications. We can also make customizations based on the needs of our customers. If you are looking to use a range of custom made heavy duty drag chains for your industrial needs, simply provide us with the dimensions and specifications and we can do that for you.